Sand, palm trees and golden skyscrapers, explore the modern architecture and ancient traditions of the richest nation in the world and home to the FIFA World Cup in 2022. 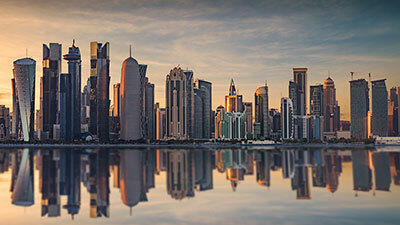 Located on a tiny out-cropping into the Gulf, Qatar is a long shoreline of beaches and dunes, with futuristic skyscrapers and ultramodern architecture. In the coastal capital, Doha, indulge in Arabic cuisines, go shopping in labyrinthine souks, or experience the thrill of sand dune-bashing. Wander the beautiful pure white and intricately designed State Grand Mosque or Aspire Tower, a 300-metre tall luxury skyscraper hotel that lights up like a torch and is the tallest structure in Doha. The Pearl Qatar is the most luxurious and expensive residential area in Doha, built entirely on an artificial island. Enjoy shopping, fine dining and beautiful Spanish architecture in Medina Centrale, the town centre of the Pearl Qatar. Take a refreshing stroll along the Corniche Waterfront Promenade, a great place to relax and enjoy the stunning Doha skyline. At the Museum of Islamic Art, learn about Islamic art and culture and try a savoury date cake at the museum’s café. Go shopping in Souq Wahif, centuries old outdoor market and the oldest souk in Doha, or visit the UNESCO World Heritage Site in Al Zubarah. At the Katara Cultural Village, marvel at the majestic amphitheatre overlooking the sea, wander replicas of ancient Islamic buildings, and explore the mosque made of golden sheets.